I don't understand what's happening… this just isn't like me.Yet the closer is gets to the ceremony, the more his nerves kick in. He tries to hide it, act cool and collected, and not let anyone catch on that at any given moment he may or may not pass out. FINALLY. After what seems like all of eternity, it's time to see her. His bride. Quietly he's led down a walkway… but she's not there. Instead, he takes his place in front of 50-300 people who are all intently watching him and waiting for him to loose it as soon as she walks down the aisle. The music starts. 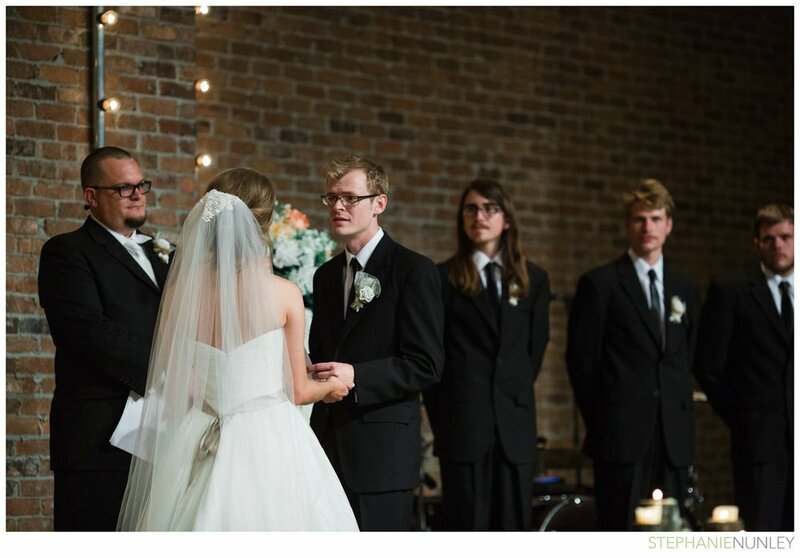 The parents begin to enter… then the bridal party… all the while he becomes more nervous, excited, and anxious. The guests stand, and finally, finally the moment he has been waiting for is finally here… he catches a glimpse of his bride. She's gorgeous… and she's about to be his wife. As she approaches, a thousand emotions, thoughts, and desires run through his head. But instead having the freedom to embrace her and whisper how beautiful she is… all he can do is smile and silently look at her. For the next 40 minutes, he is unable to express his feelings, touch her, or even speak. It's absolutely a powerful, special, magical moment… perhaps even the most significant of the entire wedding. But it's not exactly intimate. What if there is a better way? What if, instead of keeping your groom hidden until the ceremony, you led him to a gorgeously secluded space with no friends or family in sight. Somewhere he could focus. You, his love, slowly walk up behind him and gently touch his shoulder, giggling and trying to hold back the tears. When he turns around, he's overwhelmed by how beautiful you look... and the reality that he's really getting married today hits him like a ton of bricks. He is free to embrace you, cry with you, and tell you that you're the most beautiful woman he's ever seen. The tension vanishes, and you're free to enjoy this special moment together for as long as you want. Whenever you're ready, you transition into your portraits together. It's just the two of you, and there's no rush or anywhere to be. Instead, it's simply a time to be together, alone, before the craziness of the day begins. You're still thrilled and content to be together, so the portraits are natural, intimate, and genuine. You're hardly even paying attention to me. :) As soon as the portraits are over, the bridal party comes outside, and since there's still plenty of time before the ceremony begins, these portraits are actually enjoyable. They're not stressful-- it's simply a time to hang out with your best friends on the best day of your life. After portraits are done, they're OVER for the day and you don't have to think about them anymore! Instead, you can enjoy each moment as it comes and focus on spending time with your friends and family. There is still time left before the ceremony, so you smile and laugh with your bridesmaids and touch up your makeup. Guests arrive, the time comes, and soon you're ready to walk down the aisle. This time, instead of standing there in nervous anticipation, trying not to pass out, your groom waits with excitement. His bride, his best friend, and the woman he will spend the rest of his life with is coming towards him… the weight of that begins to sink in, and it's no less emotional. It's a big deal. A really big deal. And he is free to appreciate that fact without his nerves getting in the way. 1. The first look calms your nerves and helps you enjoy the day. Although they shouldn't be, weddings are stressful. There's a ton of pressure knowing that all eyes are you and they expect you to look your best, be on time, and not trip and fall on your face! On top of that, you spend all morning being extra cautious not to run into the one person you most want to see! Your future spouse is the only person who can put your mind to ease… and once you see them, you're instantly calmer and feel more free to express your emotions and have fun. 2. You have time alone on your wedding day together. When you follow the traditional timeline, this just doesn't happen. The first time you see each other is at the ceremony, and from then on, there are people with you CONSTANTLY. The first look allows you to be with the only other person who really matters on your wedding day, and also puts you in the perfect mood for your portraits together. 3. You get more portraits when they're done before the ceremony. If this is a priority for you, there needs to be time scheduled to make it happen. I know that a LOT goes into your wedding day, and these portraits are what you're going to have to remember it by (and the ones you'll want to decorate your home with!). A lot goes into looking your best on your wedding day, and it's a shame when you only have a few portraits that were taken in 15 minutes to remember it by. Even though I'm a big believer that the candid, journalistic photos are the most important… I also just got married and really cherish the portraits of just Lucas and I together. 4. You don't have to keep your guests waiting between the ceremony and reception. If you choose a traditional timeline, it usually takes over an hour to photograph the family, bridesmaids/groomsmen, and the couple. That's over an hour that your guests have to wait. I've been to weddings where, by the time the couple finishes their portraits, many of their guests are leaving. I really want you to be able to spend time with your guests who, in many cases, traveled a long way and made major sacrifices to come! 4. Portrait time is less stressful. The thought of making your guests wait over an hour while you rush through portraits is very stressful, and often means that you don't enjoy them as much. Usually, this shows up in the final product, and it also means that you look back on that part of your wedding experience with less than the fondest memories. 5. The groom's reaction is no less special when you walk down the aisle. Again- this decision is ultimately COMPLETELY UP TO YOU!! Knowing the advantages and disadvantages of both routes means that you'll make an informed decision that's right for you! Whatever you choose, you're wedding will be beautiful, special, and the best. day. ever.